When it comes to sending mail in Rails there are plenty of solutions and the best practices are fairly widely known. There are also a number of third party systems that can help you out. Receiving email in Rails however is a slightly less documented prospect. It should be noted that I am the creator of one of the service providers (CloudMailin) however I appreciate that not all people want to use external services or have different needs and I am trying to make this article as objective as possible. Having said that if you do have comments please feel free to contact me. This approach has some serious disadvantages though, especially when it comes to scalability. Firstly every time you receive an email you are spawning an new instance of your environment with script/rails. This is a nightmare in itself. Along with this you also need a copy of your app on the same server as the mail server. So you either have to add the mail server to your app server or you need another server and copy of your app running for the mail. You also have the hassle of setting up a dedicated mail server just for the purpose of receiving these incoming emails. You could of course remove Ruby from the mix here entirely but using a Ruby script allows you to perform any processing if you want to in a more complex example. cUrl -d will send the request as application/x-www-form-urlencoded but you could also send the data multipart/form-data if you wish. This method has the advantage of being a little more scalable as nothing really changes in terms of your app. You simply receive the message over HTTP like any other form post or file upload. You may want to opt to move the processing out to a background job though if you are doing anything complex with the message. You will still however need to install and setup your own mail server. In the last example we received email via an HTTP Post as a webhook. There are a couple of options for taking the setup and monitoring stress out of receiving mail in this manor without having to install an configure a mail server. Two of the options here are CloudMailin and smtp2web. 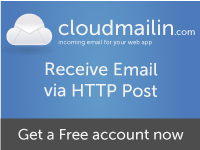 CloudMailin is currently in free beta and allows you to register to receive email via HTTP Post. The system was designed to be scalable and provide some additional features like delivery logs to make sure your app is receiving the emails. That’s enough about that one as I don’t want to be biased. smtp2web is a google app engine instance that can be used to achieve a similar goal. It make use of app engines ability to receive email and then forwards the messages on to your web app. Both of these options are designed to operate in ‘the cloud’ and don’t require you to own or setup a mail server to do the work. You will again probably want to make sure that you move processing over to a background worker if you have anything complex to do so that the processing doesn’t take up resource that should be serving your app to your customers. Finally this solution makes sense when you need to collect messages from an existing mailbox. You don’t have to own your own mail server but you will need to be able to run cron or a daemon to collect mail at regular intervals. Although you could roll your own collector there are a couple already out there. Take a look at mailman for example. This approach can either rely on direct acces to your blog or can again POST via HTTP. I will also look to write a separate post on MailMan as I think the power offered by MailMan is a worth a blog post in itself. Although there will be a delay with any polling as you can only poll every few minutes, in some situations using an existing mailbox is the only option.